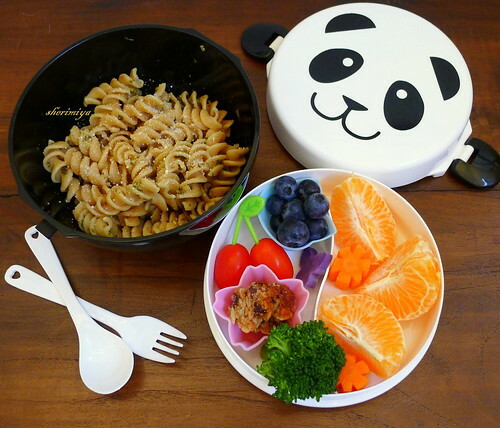 Happy Little Bento: Pesto Pasta Panda Bento - the first bento of 2013! Pesto Pasta Panda Bento - the first bento of 2013! Pesto Pasta Panda Bento, a photo by sherimiya ♥ on Flickr. Well, it's been quite a long time (about 3 weeks) since I've made a bento, taken a photo and posted to the blog. But I'm baaaa-aack! School started last week, actually, and that's when I made this one for TinySprite. It's simply some whole wheat rotini pasta tossed with pesto and sprinkled with parmesan. Easy! And it's usually the first kind of bento I make when we get back home and face an empty refrigerator. The top tier of the beloved panda bowl bento holds some satsuma mandarin segments, a tiny cup of blueberries, a couple grape tomatoes, steamed broccoli and Okinawan sweet potato, carrot, and a piece of homemade granola bar. So glad we had enough odds and ends around the house to fill up a decent bento lunch. Welcome to the new year, friends! I am always so jealous of how much light you have in Cali! I always have to resort to artificial lighting and it is just not the same. Your pics are always so bright and cheerful! Haha! Well, the citrus is fresh... it is the first thing I go out to replenish! Glad you are back!! Trying hard to do bentos too and you're a great motivation! That's great Kimmy!! Thank you so much! Thanks a lot for the encouragement Madelein! I hope you have fun making bento (for 6; wow!) ~!